One of the biggest struggles in choosing to do your engagement session in the winter is finding a place to shoot. Most couples don’t want to be outside in the arctic element so decide to choose a warm indoor location for their Engagement Session. Shooting these photographs at an indoor location can bring about a classic aesthetic that cannot be fully achieved outdoors (depending on what location you choose) but here’s what you should know about choosing an indoor location and what you should do to make sure everything goes smoothly during your session. First things first, Call Ahead of time to check with the locations operators to make sure if it’s ok if you come into their space to shoot your personal engagement photos. Some venues require you to speak with their sales or event manager to schedule a date and time. Some venues also require you to sign a waiver and place a deposit to hold your date. If you do not contact the venue for clearance before you arrive to shoot your photos, you run the risk of not being able to start your session or being escorted off grounds once you start. After you have everything squared away with the venue let your photographers know if there are any special limitations or stipulations set for the time that you will be there so they can take full advantage of their time there. Let them know if you have any special requests or anything in particular that you are looking forward to doing while at this venue. Another thing to keep in mind when planning your indoor engagement session is to plan your outfits to compliment your venue’s aesthetic. 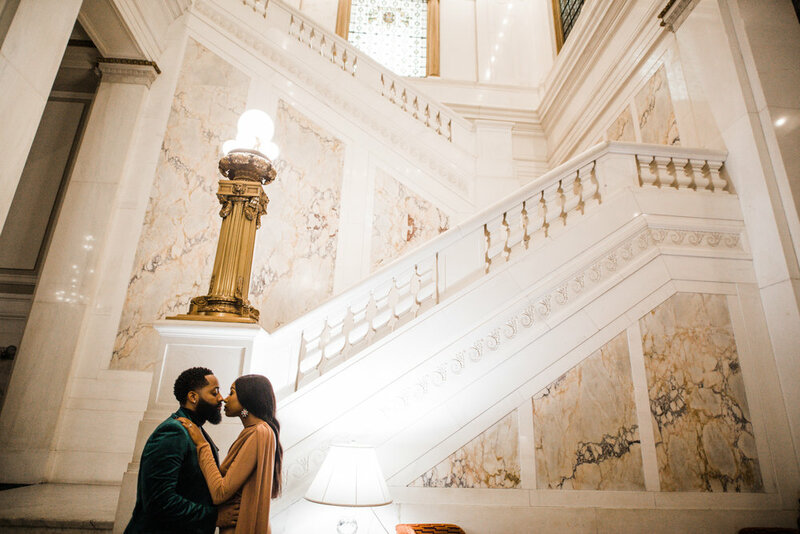 Keisha and Anthony smartly chose their outfits to match the classic and chic style of Hotel Monaco. 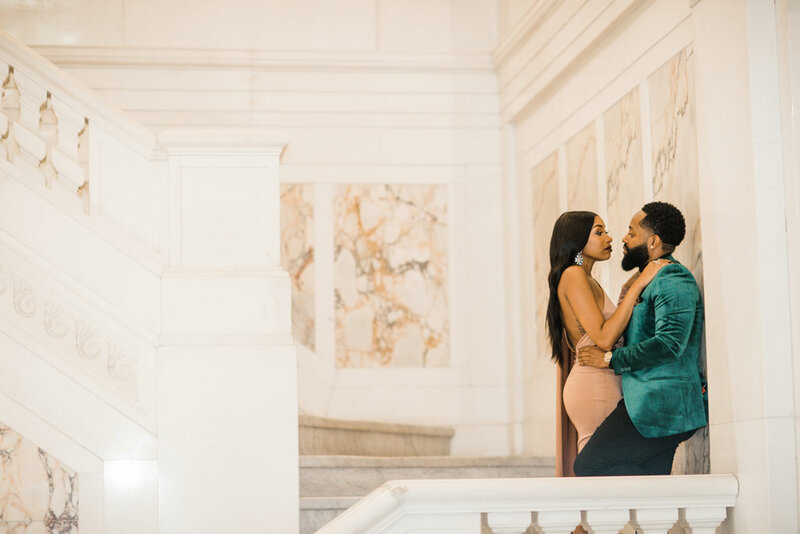 Anthony wore accents of Versace in a custom velvet green suit jacket while Keisha wore a sleek mocha gown with emerald green accents to compliment her Fiance’s outfit. The couple stood out at the venue while still matching the overall feel of the architecture and decor of this venue. Keep in mind, if you choose an indoor location during the venues’ peak time, more than likely there will be other people around visiting. Although this does not affect our photography (we can easily crop or clone people out of the background in most cases), it could interfere with how the two of you feel as a couple while taking these personal photos. 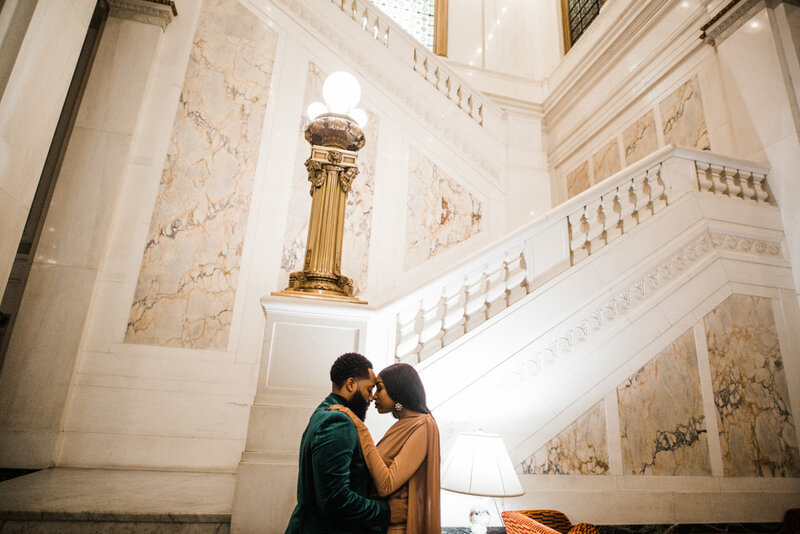 To help avoid any awkward feelings we highly recommend checking out these tips (click here) to help you be your most authentic self during your engagement session.